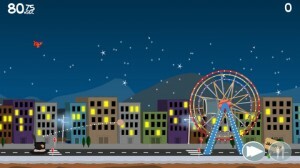 Penny Can iPhone Game Review: Worth 99 Pennies? 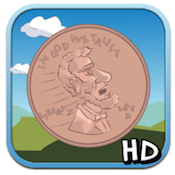 Penny Can is an iPhone game developed by Bradley Lyonsof Five Docks. 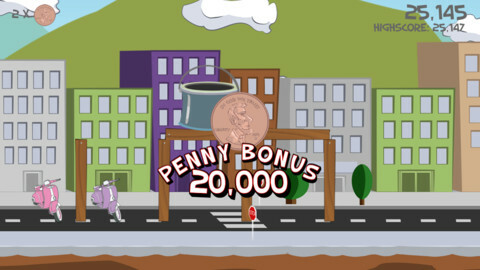 Penny Can features 45 levels of flicktastic fun, where players try to send a giant penny flying across a landscape littered with ramshackle structures. Your goal: get the penny to land in a big ‘ol can, gathering additional coins along the way. Think of Penny Can as Crush the Castle, but minus the medieval stuff. The controls for throwing the giant penny are a bit tricky to master, but it won’t be long before you have precise aim down pat. But trust me: getting to that point will be quite frustrating. It is often very hard to tell how much velocity and at what angle your shot trajectory will be set to. One issue that plagued my playthru of Penny Can were the glitches. In between levels, the screen would sometime freeze, and show a blend of the previous and upcoming level screen together. If I closed out of the game or even just went to my lock screen, the glitch would pass, but it was still annoying. Getting the penny isn’t the only way to score points, and in fact, there are usually multiple coins on the board. Getting a three-star rating is tricky, and each level will take some experimentation to fully map and strategize. While Penny Can doesn’t really seem to bring anything new to the “throw stuff at wobbly structures” genre of mobile games, it is a solid title. If you’ve got 99 spare pennies of your own that are just burning a hole in your pocket, Penny Can would be a good game for you to check out. Designed with the iPhone 5 and Retina specs in mind, Penny Can’s simple graphics look great on both old and new iOS devices. 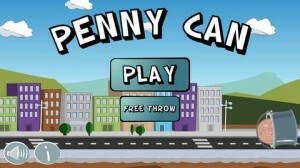 Penny Canis compatible with iPhone, iPod touch, and iPad. Requires iOS 4.3 or later. This app is optimized for iPhone 5.